You are here: Home / Damp / Condensation / Toxic mould is a myth – but would you want to live here without sterilising first? This week I’ve been involved in an interesting mould remediation job. 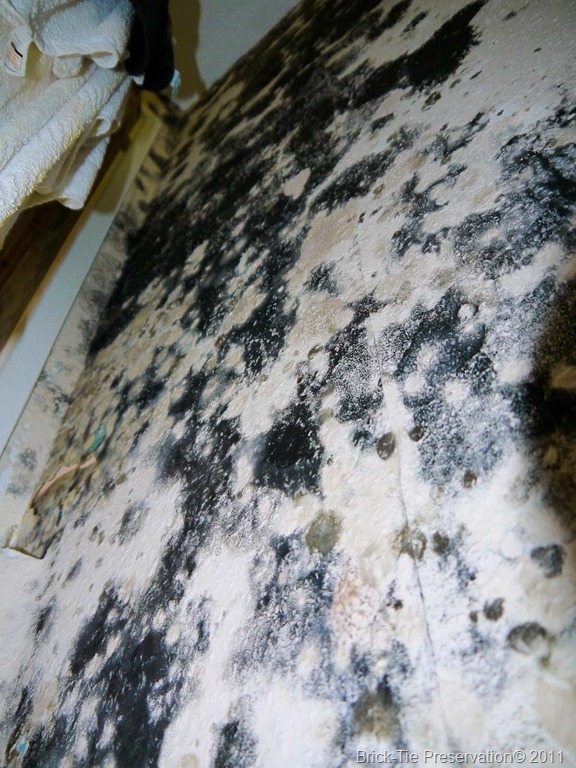 That doesn’t mean that the odd patch of mould is anything to fear; mould spores are everywhere and it’s impossible not to breath them in; every second of the day. However, there are times when some care is needed. . 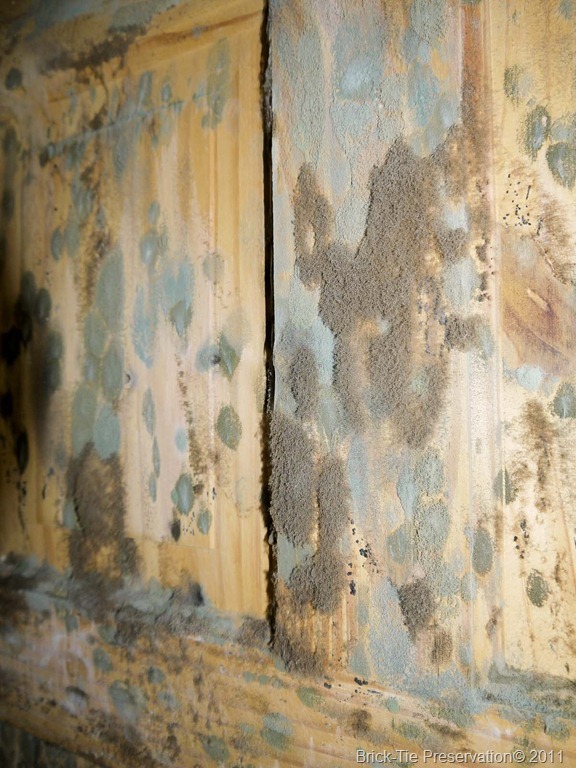 In industry, the toxic effects of mould are well known, particularly in farming, where stored grains and such get contaminated with mould and can; in high concentrations, lead to quite serious (but rare) and debilitating illnesses. In homes though, we are not generally at risk. Though when I say that, I mean most of us are not at risk. Some people suffer quite ill effects when they breath in Pollen or eat nuts; it’s the same with mould spores. Further to this, in a tiny minority of people, mould can be a serious threat, if they are acutely allergic or already have a poor immune response, especially if their respiratory system is compromised. Those recovering from surgery or elderly people convalescing spring to mind. Sometimes though, there’s more than the odd patch and I’ve posted these images and a short video to show how mould species can really get going if we make life easy for them. Moulds need only three things: Air, water and food. The air is everywhere and so is the food. It’s moisture that makes the mix just right for germination and growth. So when several million tones of leaves are shed each winter, onto the damp ground, moulds consume them in no time. Add some water to the cellulose based materials in our homes, such as paper clad plasterboards, chipboard units and cotton and wool and bingo; mould gets to work within short order. A plumbing leak or pipe burst will saturate a house in no time. The water does little initial damage, but the porous materials soak it up like a sponge. Once saturated, conditions will remain suitable for mould for weeks or months. The images show how mould and other fungi find food on all surfaces; dust is mainly skin cells and then there’s all that cellulose I mentioned. Conditions in an enclosed space like a damp house, roof void, sub-floor void or hollow partition are ideal; better that the floor of the forest in winter. Hence the spectacular growth and variety of species, which spring up over the days and weeks following a flood. Once established the moulds do what they do best, which is make more mould and shed spores by the billion. I don’t want to come over all Prof Cox, but they really do shed billions and billions of spores. I dare say that there are more spores in the world than grains of sand; so maybe we should use spores instead, when ruminating on the size of the universe? 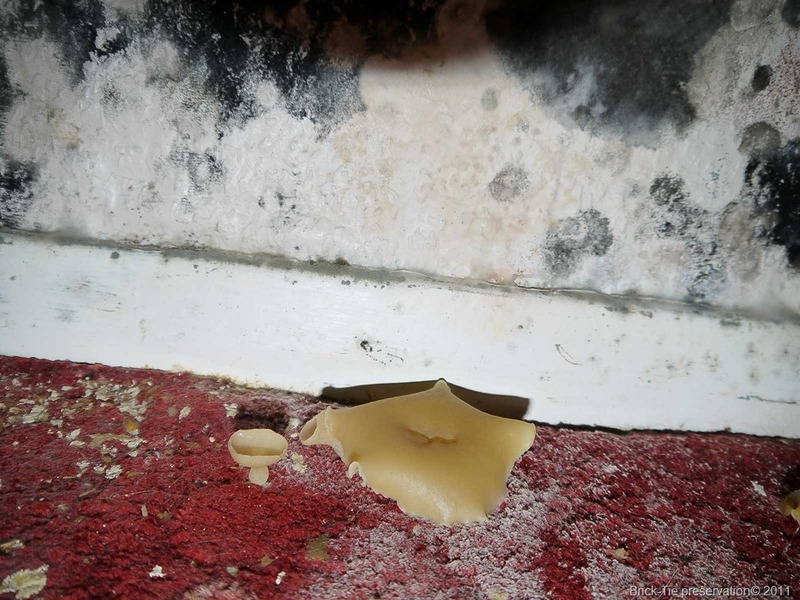 All the mould damage in the video could have been avoided, as could much of the damage to carpets and such. Water can be washed out of carpets and they can be dried and recovered. Here though, we have a house which is saturated and needs to be sterilised, emptied of all these fittings and such and then thoroughly dried out. Drying needs to be done carefully and has to be monitored properly, so that the true moisture content of the building fabric is known, before it can be re-occupied. It’s not good enough to dry the exposed surfaces; the concrete slabs, walls and plaster will be wet in depth; premature re-occupation will only fail, once the heating is on and the hidden water is driven out by evaporation; causing more damage. For more information on mould remediation and drying buildings try The National Flood School. They run a number of courses dedicated to this work. I attended there last year and am looking forward to going back for more.